From the Owners of the Bend Oregon room: We placed an 8 Unit EESystemin an unique and beautiful room, designed specifically to enhance and enrich the Scalar Field experience. The design theme of the room is intended to inspire a felt-sense of limitlessness. The numerous design elements enhance a deep organic resonance and harmony that facilitates a natural and gentle transformation into transcendent states of consciousness. 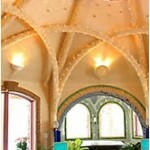 The open ceiling is an ascending octagon with 200 feet of interweaving arches. 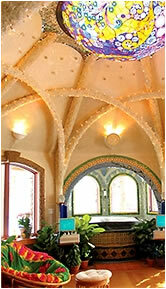 The arches are entirely covered with more than 80.000 crystals. At the apex of the ceiling is a 7ft convex stained glass dome with more than 3800 pieces of glass and more than 400 Swarowski crystals. The room itself contains more than 20.000 pieces of tiles and mosaics, creating an artistic intimacy and dimensional richness of interior textures and prismatic color. Four infinity loops are inlayed with copper into the floor, creating a flowering geometrical shape that is rumored to lay deep in the earth directly beneath the Sphinx stature in Egypt. For night time sessions, 560 mini lights blend with other hidden lighting to enhance a sense of drifting through magical dreamscapes. An 8 speaker sound system can be computer programmed to create many different auditory environments, including whole brain resonance and other psycho acoustic programs.